Wang Wanjiao has already spent more than 100,000 yuan ($15,710) on her daughter over the past two years - and she's only 18 months old. While Wang was pregnant, she started buying famous branded products for her future baby. These included a feeding bottle of more than 800 yuan ($126), a pacifier of more than 600 yuan, and a bassinet of 6,000 yuan. Since her daughter's birth, Wang does everything she can to buy "the best" for her daughter. She buys imported infant formula from countries including Australia, Germany and New Zealand, costing her more than 500 yuan per package at a time. She has also begun looking for a good kindergarten for her daughter. She thinks a bilingual kindergarten in Chaoyang district will be great, which costs about 5,000 yuan per month. "My family is not that rich, but we have to give our daughter the best we can afford," said Wang. "It's normal nowadays for Chinese parents." According to a report from socialist Xu Anqi, published by the Chinese Academy of Social Sciences in January, the average cost of raising a healthy Chinese child from birth to university graduation is 490,000 yuan. Since the report was based on the economic development level in Shanghai in 2003, many parents think the real cost today is higher. Recently, the topic of "the cost of raising a child" has been heatedly debated on Sina Weibo, with the start of a new school year. Net users from different cities in China listed the estimated cost from the mother's pregnancy to the child's university graduation. The cost far surpassed the 490,000 yuan estimation by Xu. Many Net users in the discussion calculated that the cost in recent years in Beijing has reached 2.76 million yuan. As a result, many parents are questioning whether it is necessary to spend so much money on raising a child. Xia Xiaomin, owner of two online shops selling high-end mother and baby products imported from overseas, said more Chinese parents are spending a lot on their children. "I seldom have orders of less than 1,000 yuan. The New Zealand formula is sold by the dozen, which costs over 8,000 yuan. Luxury toys such as a Hermes toy horse and a Gucci bear are popular among parents," said Xia. In Xia's online shop, a pack of imported wet wipes from the US, which is said to be all natural and hypoallergenic, is sold for 105 yuan per pack. Similar ones in local supermarkets cost less than 20 yuan. Still, the imported US wet wipes are one of her best sellers. While well-off families can afford top products for their children, for the average Chinese family, the birth of a baby means added economic pressure. As a result, some families are choosing not to have a second child. Liu Shuang, who works as a shop assistant in Beijing, has a 9-month-old son. Both Liu and her husband are the only children of their families and they are allowed to have another child. They had planned to do so until recently, when Liu and her husband abandoned the plan. "Every month we spend more than 3,400 yuan on formula, supplementary food, clothes and toys," said Liu. "We earn about 20,000 yuan each month and have to pay the mortgage and car loans of 10,000 yuan. Our finances are tight." Still, Wang and Liu said only the best will do for their babies. They have less confidence in Chinese babies products, especially baby formula. "Expensive things are expensive for a reason," said Wang. "I not only buy imported things, I buy good quality things." Professor Li Zhaobo of the Business School at the Chinese University of Hong Kong, believes it is unnecessary to spend so much money on a child. "Common middle-class families can all afford to raise children and allow them to grow up happily and healthily," said Li in a 2014 Global Times report. In the report, Li made a comparison with raising a child in Hong Kong. According to a 2014 report by the Bauhinia Foundation Research Center, a think tank founded in 2006 which collects and analyzes data about Hong Kong's social development and people's well-being, if parents choose the 12 years of free education without attending any extra-curricular classes, keep the consumption levels of food, clothes and entertainment low, and do not travel often, it should not cost more than 980,000 Hong Kong dollars ($126,420) to raise a child, and put them through university. However if private kindergartens, regular traveling, and relatively high expenditure on food and clothes are factored in, the research pointed out that the average cost for regular families to raise a child is 5.5 million Hong Kong dollars. Japan is another place where the cost of education is found by many to be rather high. However, the current situation of raising a child there is a little bit different to China. "The parenting methods in China and Japan are quite different," said 26-year-old Nika Wang. She moved to Tokyo when she was a teenager, where her mother married a Japanese man and had another daughter. According to Nika Wang, at first her mother was a typical Chinese mother, wanting only the best for her child. But after marrying her Japanese step-father, she changed her mind about spending so much on material goods. "Both my sister and I went to a public kindergarten, primary school and high school, and we saved a lot of money this way," said Nika Wang, who now works at a trade company in Tokyo. She said although her family are well-off, her parents never bought expensive food, clothes and toys, because they think too much of a wealthy and comfortable life may make children weak. "The largest sum of money spent on me was for the kimono (traditional Japanese costume) for my coming-of-age ceremony," said Nika Wang. "It cost them more than 1 million yen ($8,300), but they did not hesitate, because they thought it significant for me, and worth it." According to Wang Wanjiao, many other parents around her are all buying their children expensive things. "My friends' children wear Gucci, and it will be a shame that mine wears unknown brands bought online," she said. "I have the ability to give my child a good quality life, and I am scared of reading news that cheap clothes contain things that are harmful to children." Liu's 11-year-old niece has both the latest iPhone and iPad even though she's only in primary school. "Her parents have no choice, because her classmates all have one, and it is embarrassing to not have one in such a class," said Liu. "Being viewed as poor, teased and isolated is unbearable for adults, not to mention children." 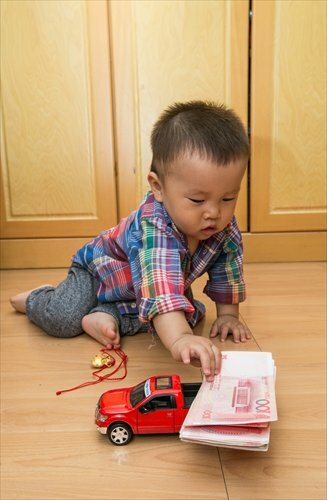 According to Xu Lin, a registered family and child psychologist in Nanjing, Jiangsu Province, the trend of Chinese parents buying their children lots of luxuries reflects an abnormal state of mind. "Would babies know whether they are wearing a luxury brand or homemade clothes by their grandparents? It is the same to them," said Xu. "Offering the best things to children can create a sense of satisfaction for the parents, and they are actually spending money for themselves." Xu said parents should develop proper consumption views, choose the most suitable pattern of expenditure based on the family's economic situation, and stop making comparisons with others. "Only if your children are healthy and happy, is your parenting successful," said Xu. "The most expensive things are not always the most suitable."